When searching for the right decor for your home, sometimes it’s good to look in your very own backyard. Incorporating items inspired by nature into a room’s design is an easy way to add warmth to the space and give yourself and guests a natural feeling of comfort. Nature by design is harmonious, so it is easy to understand why people like to go outside for fresh air or to clear their heads. The beautiful balance the outside world maintains has the power to bring our bodies and minds back to equilibrium again, which is why it is always a good idea to bring some of the wonderful qualities of outside into your home. Simple changes are all that’s needed to get started. Allowing lots of natural light in during the day is an easy one. If you have heavy drapery, try a lighter fabric or install tiebacks for each panel to give the sunlight a direct path into your home. Find more natural materials to incorporate into your room’s design. A wooden fruit bowl on the table, decorative woven baskets placed throughout your home and potted indoor plants are quick fixes. Even using pictures of landscapes and fruit illustrations is an effortless way to bring some natural inspiration to your living space. Floral patterns on a bedspread or leaf-patterned wallpaper are clever ways to bring some outdoor beauty to your interior as well. Keep fresh flowers in a vase on your table and grow herbs that hang in little baskets from the window above your kitchen sink. There are so many little ways to honor nature in your home. Larger ways to bring some nature indoors can be accomplished through furniture and flooring choices. 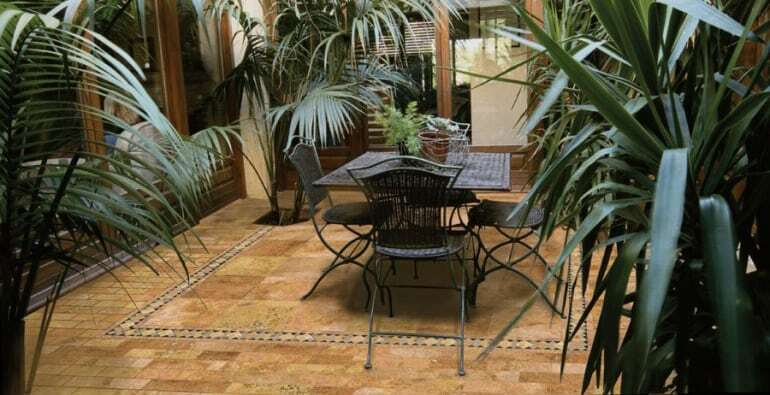 Wicker furniture for a sunroom, an unfinished wooden table and chair set for the dining area and natural stone tiles for the floors are all great ideas. For wall colors, keep choices within the scope of hues you would see outside. Nature has so many different color offerings so your selection won’t be limited. Just think of some of the places you have loved to visit and pull every color out of the picture you have of it in your mind. Now get outside and find some inspiration!